Get out and see something! I have known about geocaching for some time, but I kept forgetting about it. So, after being reminded of it again, I decided to try it out. I went to geocaching.com and was amazed at the number of caches in our area. There are even some in our neighborhood. So, I decided to try to find one with the kids Thursday on our way to the library. I downloaded the demo of a geocache app for my Android phone and headed to a cache near our home. 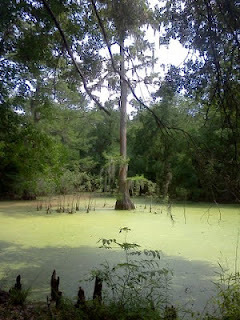 After following a narrow path into woods by a cypress swamp, we came out empty-handed. So, we headed to another one near an office building. Unfortunately, we couldn't find that one either. However, we did see plenty of wildlife, including a five foot black rat snake. So, that night I went back to the website and watched some of the videos for beginners and studied more of the caches in the area. I finally found one with a shoebox size cammo box hidden in the National Cemetery a couple miles away. Sometimes, I have parents who are a little overwhelmed by how many outings we go on with our kids. There are many families who find it hard enough to fit in the things that have to be done, let alone finding time to plan and then execute a trip. So, today I thought I would share about the learning experience we had a few feet from our back door. A simple thing like sending the kids to play in the backyard yielded the discovery of some new backyard animals. We have had lizards, pill bugs, woodpeckers, squirrels, cardinals, robins and other insects. But, today we found a slug and a bat. The slug was found under a large stone. After it scooted away, it left behind a shimmering slime trail that we were able to observe. The bat was just a couple inches long and hanging onto a low spot on the tree. It moved a little, so we knew it was okay. We were able to talk about nocturnal animals and why bats are good to have around. Wamego is a small town in Kansas with a great marketing strategy. We stayed there one night and saw their town's pamphlets. I lived in a small town and I was immediately impressed with their brochures. I was also excited to see that with the help of a grant from the state and volunteers from the town that they had become a town for fans of Wizard of Oz. They built an Oz Museum downtown with displays for all the characters as well as memorabilia. It was not a planned stop on our trip, but it was a fun addition. If you go to their website, ozmuseum.com, you will find information about the museum as well as a scavenger hunt to use when you visit and a word search and a crossword puzzle that could be used if you are reading the book. The museum costs $7 for ages 13 & up, $4 for ages 4-12 and free for ages 3 and under. It is open March through October. I have always loved to travel. Even though my parents never had a lot of money, traveling and seeing new things was always a priority. Whether it was going to a park, museum, play or to visit friends or family, I loved to go. Just as my parents often lived far from family and had to travel to see them, my adult life has been lived away from family as well. Because of all of the traveling we have done as a family, I have been to 34 states and even our 3 year old twins have been to 24 states. People often seem amazed that we do so much traveling with young children. I think one of the reasons it works so well for us is because we have done it their whole lives. They don't know anything different and so they have adapted. I am sometimes afraid we have created little travel monsters because they are always eager to jump in the van and go somewhere. In July 2010 our family visited the state capitol of Kansas in Topeka. It is what I consider a traditional looking capitol with the dome in the middle and wings coming off the sides. It is an impressive building. Each capitol has unique features and this one has a lot of copper and bronze that was used on columns, staircases and architectural accents. Personally, I found the look very appealing and not gaudy. There are many murals throughout the building. Another unique feature is the old historic "cage" elevator that is still in operation. It was installed in 1923 and the legislature resolved in 1976 to keep it maintained for historical value. An attendant operates it for you. The capitol has a great website with lots of information, including a scavenger hunt and a 28 page guide you can download. You can find it at: http://www.kshs.org/capitol. When we studied American History last year we traveled to many historical sites in America, as well as several state capitols. I am sure many parents think a state capitol is not a place for children. But, I disagree. State capitols are all FREE to tour. When you have kids, free is good! Plus, there is always something to see in a capitol. It usually has big rooms, high ceilings and colorful murals or pictures. It may not have hands-on displays or high tech gadgets, but give it a chance. You may be surprised to find that your kids don't have to have all of that to like something. We encouraged our kids to pick their favorite capitol and to find something they liked in each one. Nebraska's capitol was one of our favorites. It looks like a huge fortress. We were also able to go up to the 14th floor and look out over the city of Lincoln. It was a beautiful sunny day, so the kids and I decided to visit the botanical gardens at the Mercer Arboretum & Botanical Gardens. The flowers were in full bloom and it was a wonderful day to take pictures. The kids love being outdoors and walking the trails. Besides all the plants, we saw fish, a turtle, a frog, male cardinals (Abby's favorite bird), butterflies, a bee, and assorted bugs. The arboretum is on the other side of the main road and there is also a playground on that side, but we didn't go over there today. And... it is all free! The arboretum trails are not as varied as the trails at the Houston Arboretum, but it is flat and easy for walking.